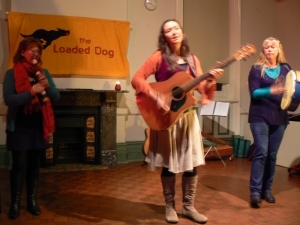 Our August Loaded Dog was a night of harmony, harp and tradition. 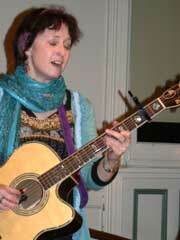 Our first floor spot was from Jenny Richards, who sang two songs. The first, simply called "The Sad Song", was a very traditional song of lost sailors at sea. She then gave us "Bell-bottom Trousers" a song with a good easy chorus for everybody to sing along with. 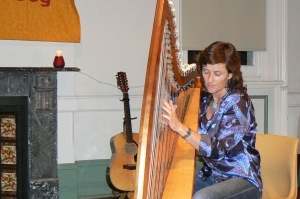 Cliona Molins played two harp solos, the first was an enchantingly descriptive tune of the flight of the earls, and the second a lovely rendition of one of O'Carolan’s tunes. The Bright Star Singers, directed by Mary-Jane Field, began their performance by processing from the rear of the room while singing an African song. They followed this by singing a simple love song written by Sinead O'Connor. In keeping with Mary-Jane's liking for songs of other cultures, the group then sang a Turkish song. This was followed by "Three Score and Ten", a song of shipwrecked fishing boats off the Yorkshire coast of England. A great rendition of the old Irving Berlin song "Blue Skies" followed. The use of the male voices was notable and created some great harmonies. Finally for something completely different they sang two old pop songs, the Everley Brothers "Bye-bye Love" and the Herman's Hermits song "Something Tells Me I'm into Something Good". The evening was shared by Ann Ridgway & Mothers of Intention. 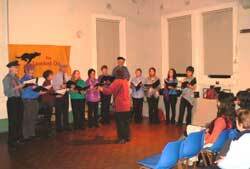 As Tony Pyrzakowski, the Mothers' fiddler was overseas, they asked harpist Cliona Molins to join them for the evening. The main performance began with Anne Ridgeway joined by the Mothers lead singer, Rosie Mcdonald. They performed a number of songs including Neil Young's "After the Goldrush" & "Passing Time", a slightly jazzy number describing the strength and healing that comes over time. Anne sang an original song called Lothorien, a lovely, descriptive song of travelling through the woods of Lorien and of the voice of the lady Galadriel, as described by Tolkien. 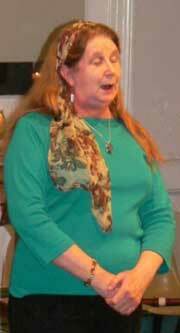 We then had a solo performance by Rosie of a song from the new Mothers CD "Sway When You Walk", reminiscing about childhood. Cliona then played harp accompaniment for a lovely version of the traditional folk song "Mantle of Green". The second set of the night was made up of the combined talents of the Mothers, Anne Ridgeway and Cliona. The highlights of the performance were "Moving On", a song about change and going home, and "Fly Little Birds", a song of journeys, the healing of wounds and sadness. The song " China Seas” was a particularly poignant song of loving and letting go, with a very haunting tune. The set included tunes, including recorder solos. I felt that the group was a little disorganised - not surprising given the change of line up - and this detracted somewhat from the atmosphere. But overall - it was a night of lovely music, great playing and good singing.